The spoiler’s in the title peeps. 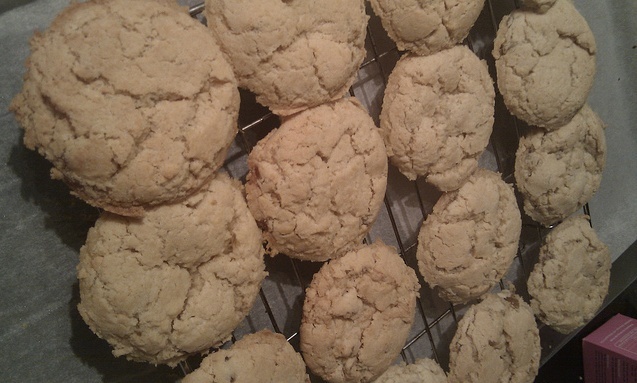 Today turned into a veritable flour frenzy at Gidday HQ as I tried my luck with my next baking challenge – Biscuits. Having bought a couple of extra ingredients yesterday while out and about – not wishing to give myself any excuse for shying away from this next frontier – I thought I’d get inspired this morning by catching up on last week’s episode of The Great British Bake Off, a series currently running on BBC. (I am now wondering whether BBC actually stands for Biscuits, Bread and Cakes but I digress). Last week it was biscuits. ‘Perfect!’ I thought making myself comfy, spatula within reach. 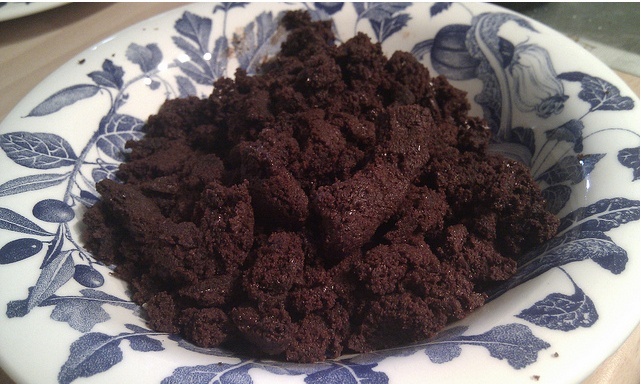 There were some disasters and some triumphs and as long as I wasn’t attempting brandy snaps (that curl thing looks quite difficult) or macaroons (a high proportion of contestant tribulations here), I figured I’d be ok.
My first recipe was Double Chocolate Cookies (thanks to a recipe in Sainsbury’s Magazine). All went smoothly, I put them in the oven to bake and checked on my 13 little biscuit bundles (recipe said makes twelve but hey, I’ll eat one to test and then we’ll be square) after about 20 minutes. They weren’t kidding when they said leave 5cm between each ‘walnut-sized’ mound (how big is a walnut anyway?) 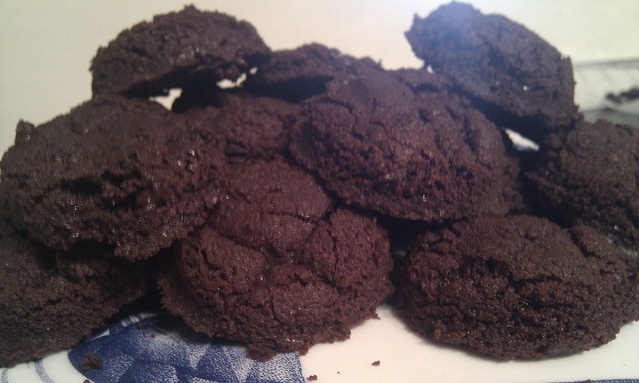 – I had one rather large Double Chocolate Cookie on my hands! ‘What to do? What to do?’ my frantic mind muttered. And then inspiration struck. 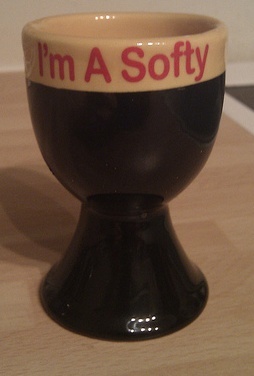 This, my friends, is what an eggcup is for! A useful gift and in Vegemite colours – what’s not to like? And so I cut and cut and cut, popped them back in the oven for another seven minutes and out came these little beauties. Proud little soldiers – all cute and chocolate-y! Inspired, I started on my second batch, Zingy Ginger and Lemon (props again to Sainsbury’s magazine!). This one took a little creative thinking as the mixture just didn’t seem to be quite as ‘roll-into-walnut-shaped-balls’-able as my chocolate attempt but I soldiered on, dribbling little dollops of water until things looked (and felt) a bit more promising. I am one who always learns lessons in life so out came two baking trays and soon there were 16 dollops ready for the oven. So I grabbed some of those little round dishes you have for dipping sauce with Asian food and Voila! After 10 more minutes in the oven, these emerged to bask on the cooling rack (their chocolate counterparts having cooled sufficiently to migrate to a plate). Then there was the great Icing Incident. Don’t try this at home without the right equipment peeps – it won’t go well. 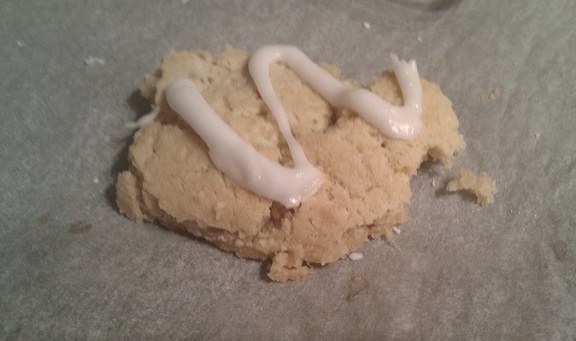 Oh dear – icing may not be my forte! Delicious – never judge a book by its cover. a) I am spatially challenged – wearing flat shoes has obviously blunted my appreciation for 5cm heels and who the heck knows what’s meant by walnut-sized anyway. 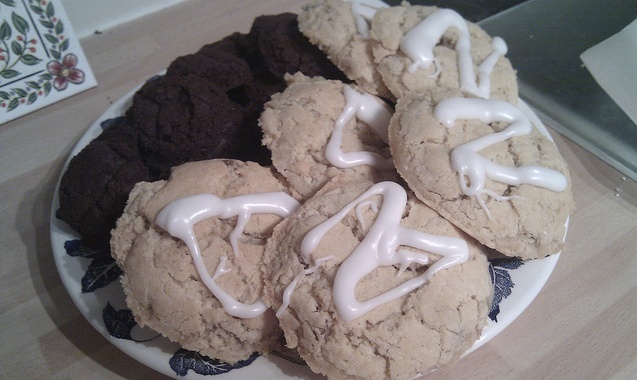 b) I used think I was ok on the maths front but I cannot for the life of me work out how that much mixture only makes twelve biscuits. c) I am not an accomplished baker in the presentation stakes but can improvise so that no-one ever suspects – I have not spent 20 years working in Marketing for nothing. d) I am a mucky pup in the kitchen – a recent learning as I have just discovered some rogue icing on my t-shirt as I sit here tap-tap-tapping away. But the proof of the pudding is in the tasting so stay tuned for the update after the people at work get their paws on them. 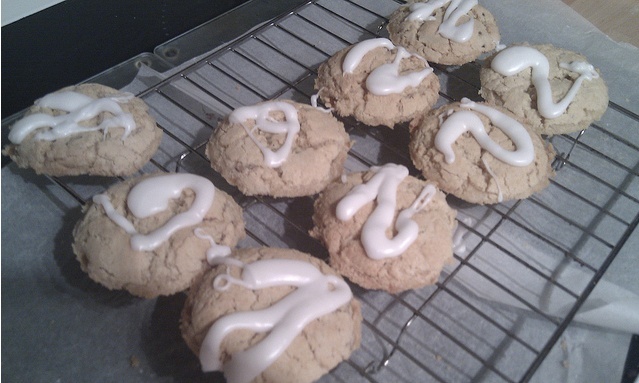 This entry was posted in Expat moments and tagged biscuits, Sainsburys, The Great Bake-Off, The Great British Bake Off by Kym Hamer. Bookmark the permalink.